The two applications has good and bad sides, I do prefer myself, to use Studio Compiler. Do not decompile properly the DOTA 2 models. This tutorial will explain the decompilation process WITH Crowbar AND Studio Compiler, and will let the user to do the final choice . First you have to download and install the application and launch it. Configure studio compiler to work with SFM or any different engine branches. Open the app and go on the Model decompile tab. On the top you have to click on Configure button. The decompiler, will gets some trouble to decompile Dota2 models, saying it cannot find the Vtx data, so you have to apply a tweak on the file. Set the output directory manually as the browser looks to be buggy. So simply copy and paste the path where you want to extract the files, I choose to decompile the smd and qc file directly into the MESA workspace so i can import the SMD Reference and Sequences directly from there. 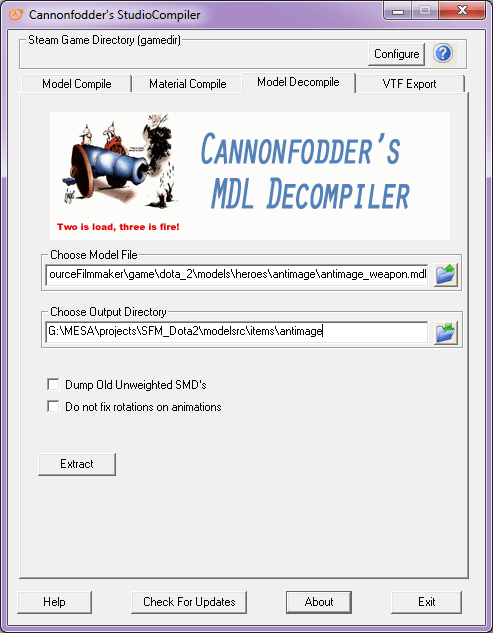 IF you are intending to import some SMD animation or DOta 2 heroes model by decompiling the model with Crowbar, choose StudioCompiler to decompile the MDL and the Animations. Use Crowbar only if you wish to get the VTA file and the Flex data from the decompiled QC file. 2. Output folder : click on Browse… to select the output folder where the file will be decompiled. I choose to decompile the smd and qc file directly into the MESA workspace so i can import the SMD Reference and Sequences directly from there. ...Writing reference and lod files finished. ...Writing animation ($sequence) smd files finished. ...Writing animation ($animation) smd files finished. Decompilation has been successfully executed so you can check the files in Windows Explorer. 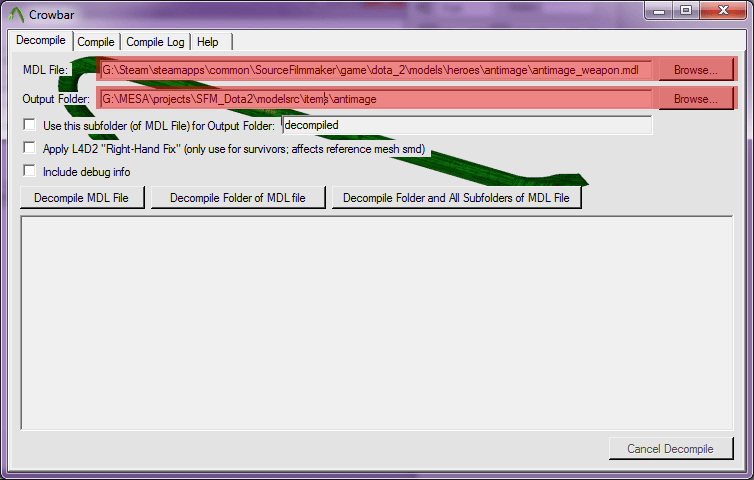 All the animation sequences are decompiled into the MDLName_anims directory. You should want to learn now how to Import the SMD files into Maya using MESA.